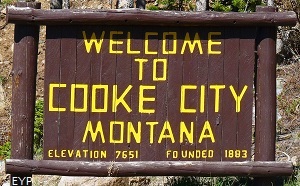 Cooke City Montana is located just beyond the Northeast Entrance to Yellowstone Park. 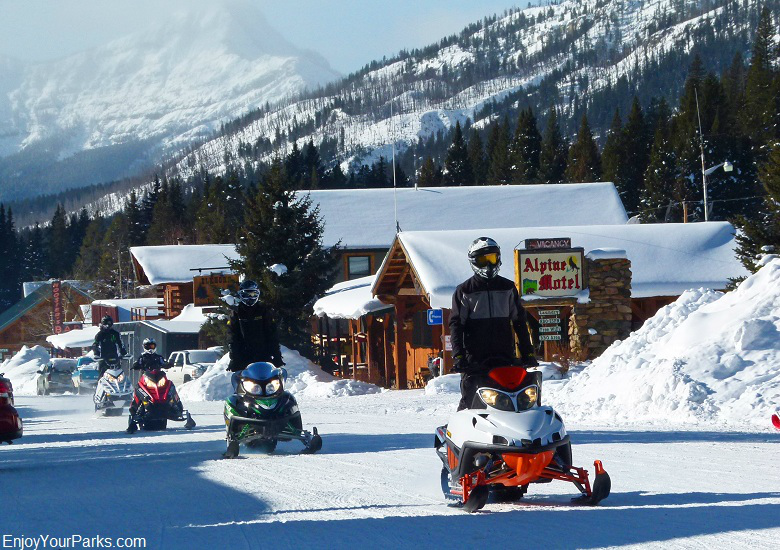 Welcome to Cooke City and Silver Gate Montana! 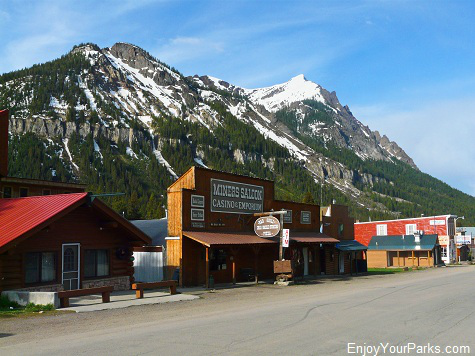 Founded in 1883, Cooke City Montana and Silver Gate Montana are small mountain towns that guard the Northeast Entrance to Yellowstone National Park. 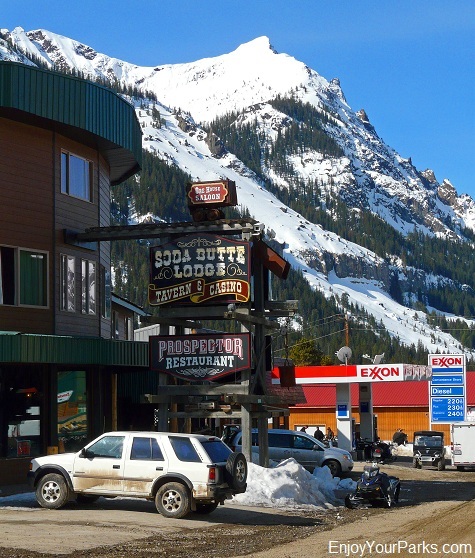 Surrounded by tall, majestic mountains, these towns are only a few miles apart and have a total of just over a 100 residents. 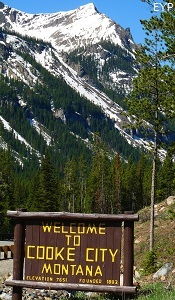 Cooke City and Silver Gate Montana also marks the beginning (or the end) of the world famous Beartooth Highway that takes you up and over the mighty Beartooth Mountain Range, and back down to Red Lodge Montana. 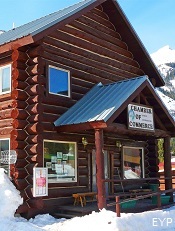 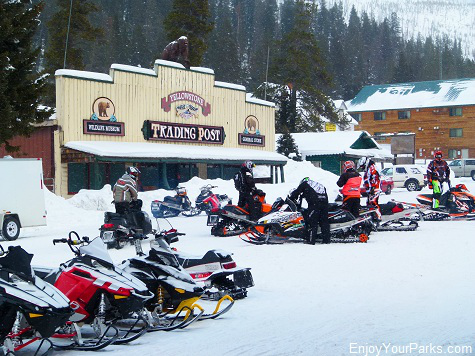 These wonderful little mountain towns are busy all year long, with heavy tourism during the summer and fantastic winter sports such as snowmobiling and skiing throughout the winter months. 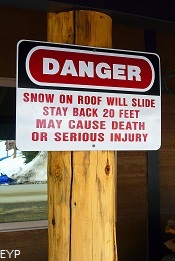 And did we just say the word "winter"? 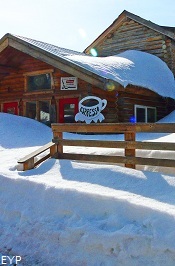 Cooke City Montana and Silver Gate Montana are famous for their unbelievable snow fall. 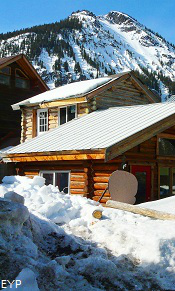 If you you'd like to live in snow 9 months out of the year, this would be the place for you to call home. 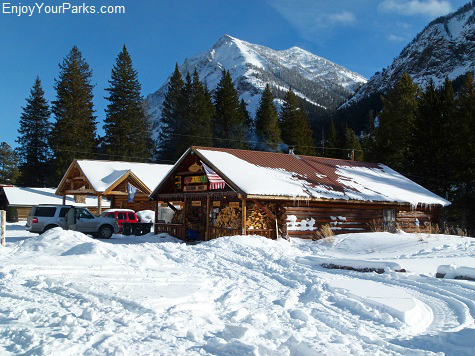 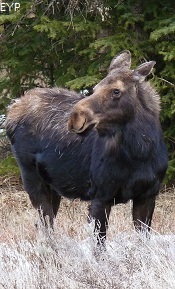 Most people however simply visit this special place throughout the winter to enjoy the amazing wildlife watching, snowmobiling and cross country skiing. 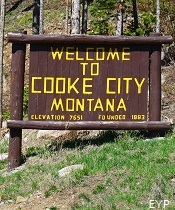 Cooke City Montana near Yellowstone National Park. 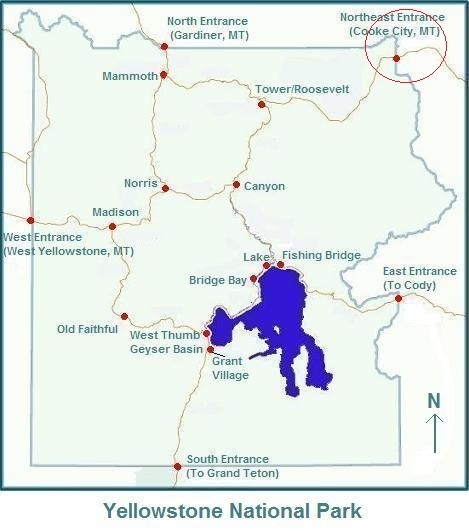 To stay connected to the outside world during the long winter months, the road is kept plowed and open between Gardiner Montana and Cooke City Montana (via the Lamar Valley). 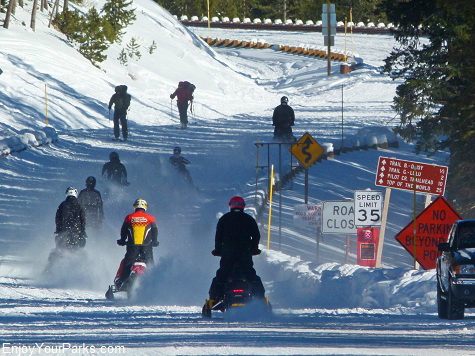 This is the only road in the entire park that is kept open during the winter, and is extremely popular for visitors wanting to see incredible wildlife and enjoy this world class winter sports playground. 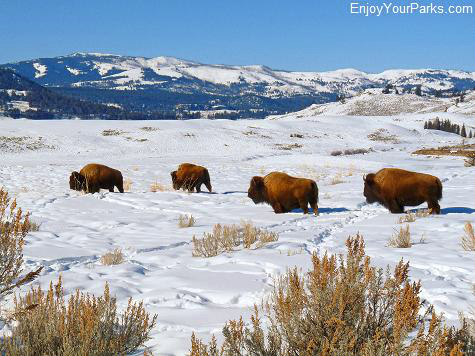 The world famous Lamar Valley in Yellowstone National Park is a great place to see many species of wildlife, including bison, grizzly bears, wolves, elk, bighorn sheep, antelope, river otters, eagles and much more. 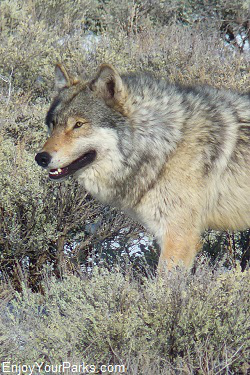 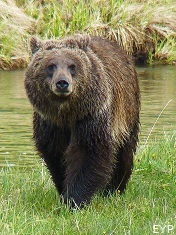 Cooke City Montana and Silver Gate Montana are also popular destinations for visitors who are driving up and exploring the world famous Lamar Valley to see amazing wildlife such as grizzly bears, wolves, elk, river otters, coyotes, bighorn sheep, bison, eagles and much more. 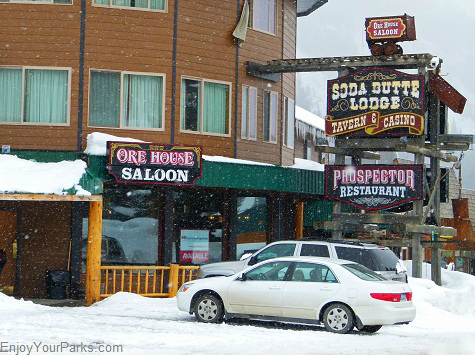 Many people end up in Cooke City and Silver Gate for a nice lunch or dinner, and either stay at a local hotel, or drive back to Mammoth Hot Springs, Gardiner Montana or wherever else they are staying for the night. 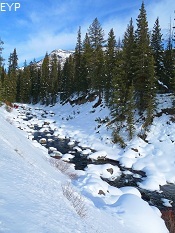 As you drive from the Lamar Valley to Cooke City Montana, you will pass through a deep mountain canyon known as "Icebox Canyon". 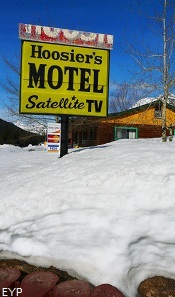 There is often times ice along these canyon walls throughout the entire summer! 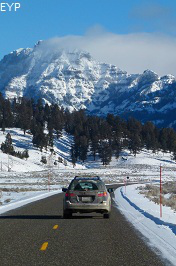 The road to Cooke City Montana leaves the Lamar Valley and enters an extremely scenic canyon with towering mountains all around. 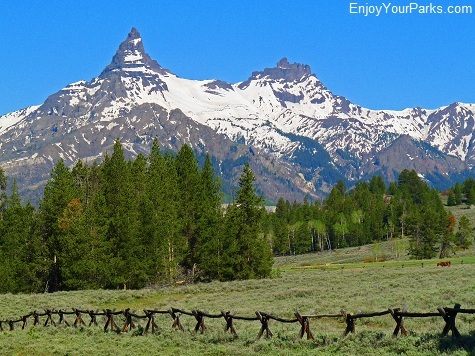 The road beyond the Lamar Valley on your way to Silver Gate and Cooke City Montana is extremely scenic. 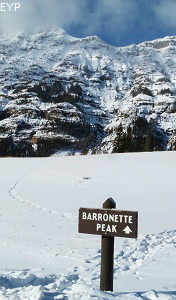 There are towering mountains on both sides of the road, such as Barronette Peak. 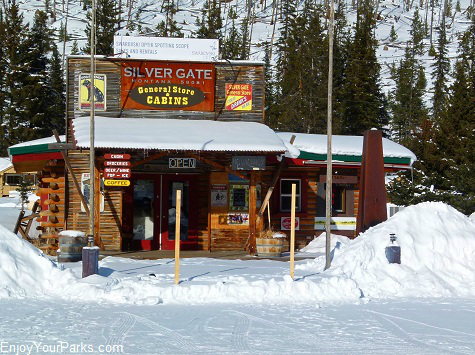 If you like tall rugged mountains, then you'll love the drive to Silver Gate and Cooke City Montana during your Yellowstone National Park vacation. 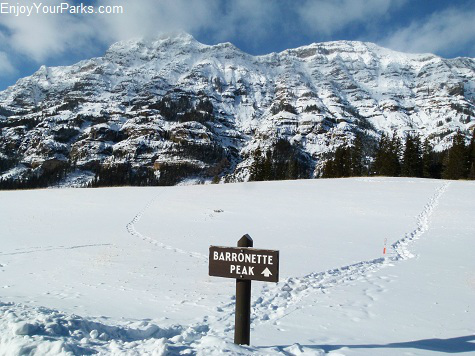 Barronette Peak is a familiar landmark on the way to Cooke City from the Lamar Valley in Yellowstone National Park. 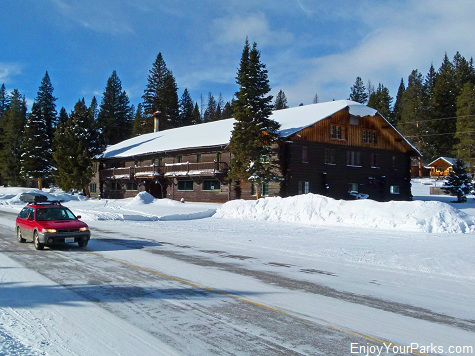 The Beartooth Highway is one of the civil engineering marvels of the world. 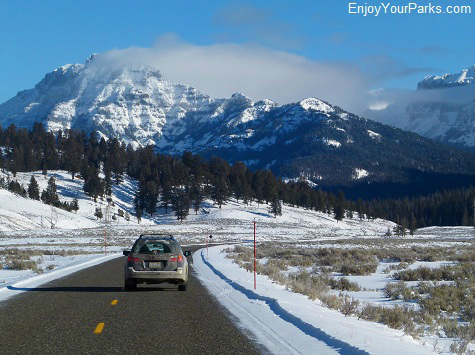 This incredible road actually climbs up and over the Beartooth Mountain Range, which is the largest area over 10,000 feet in North America! 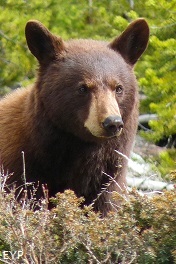 Located between Red Lodge Montana and Cooke City Montana, the Beartooth Highway has dozens of sharp switchbacks that take you to just under 11,000 feet above sea level, before you drop down to the other side. 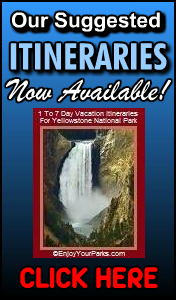 This is gorgeous and awe-inspiring drive, and you may consider taking it if if fits your schedule. 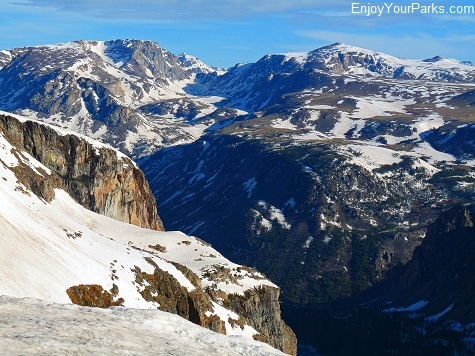 This is a view from the top of the Beartooth Highway which is just under 11,000 feet above sea level. 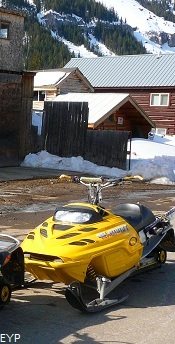 You can practically see forever up here! 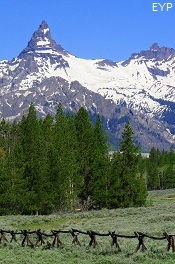 Pilot Peak and Index Peak dominate the landscape as you approach Cooke City Montana from the Beartooth Highway near Yellowstone Park. 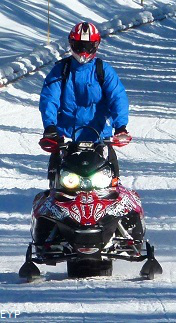 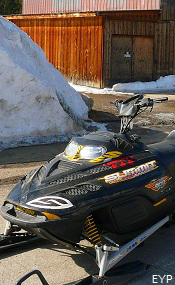 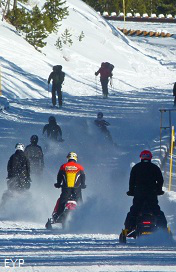 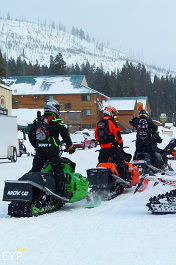 Cooke City Montana and Silver Gate Montana provide access to some of the best snowmobiling in the world. 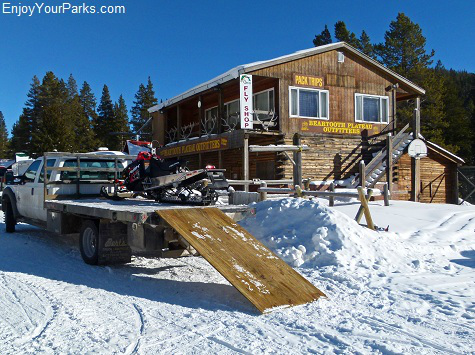 This area receives an incredible amount of snow, and the terrain is a snowmobiler's dream come true. 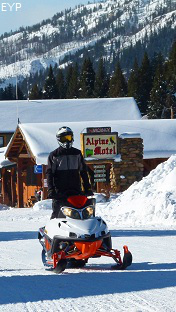 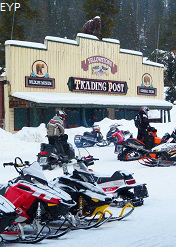 There are countless snowmobile trails that are not in Yellowstone National Park, which means you do not need a guide. 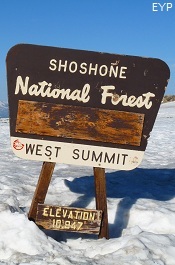 And in addition to the incredible trails in the direct vicinity of Silver Gate and Cooke City, another popular trail is the Beartooth Highway. 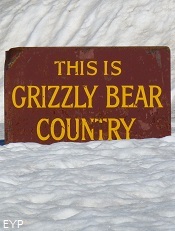 The Beartooth Highway is closed in the winter to wheeled vehicles, but is open to snowmobilers. 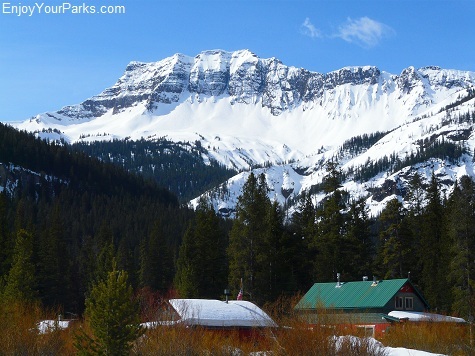 The Beartooth Highway Trail takes you up and over the gigantic Beartooth Mountains and drops back down into Red Lodge Montana. 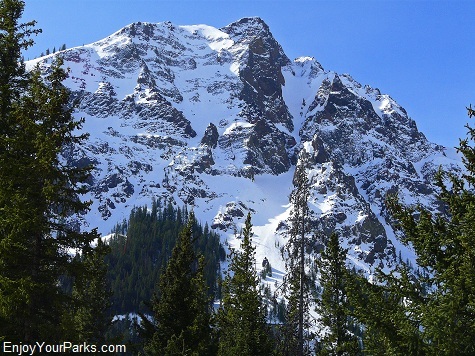 This trail reaches an elevation of just under 11,000 vertical feet. 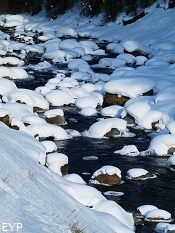 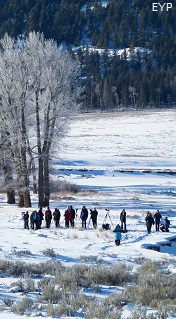 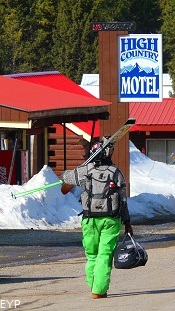 For more information on Winter In Yellowstone, click here. 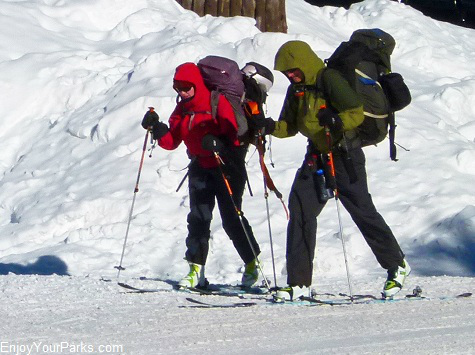 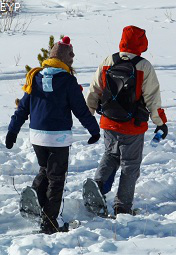 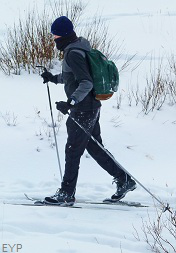 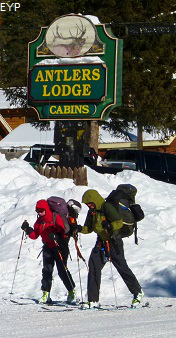 In addition to snowmobiling, Cooke City and Silver Gate Montana are also known for world class cross country skiing and snowshoeing. 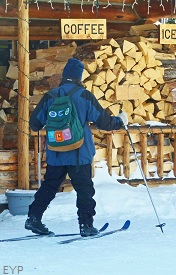 There are many amazing trails near these two mountain towns that are second to none with regard to beauty and quality. 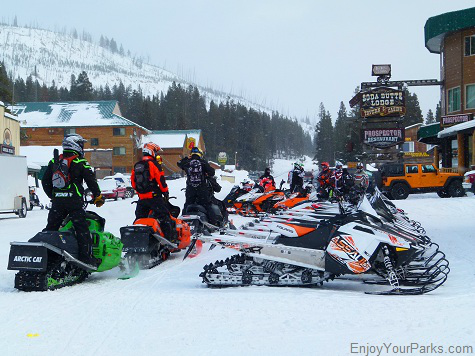 Cooke City and Silver Gate Montana near Yellowstone National Park provides access to some of the best snowmobiling in the world. 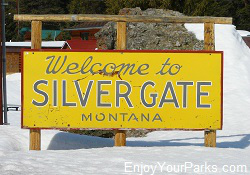 Silver Gate Montana and Cooke City Montana near Yellowstone National Park have many fun places to shop and eat. 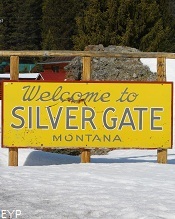 Silver Gate Montana near Yellowstone National Park. 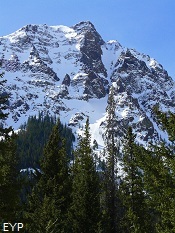 If you want to see tall, rugged mountains, Cooke City Montana and Silver Gate Montana near Yellowstone National Park is definitely the place to be. 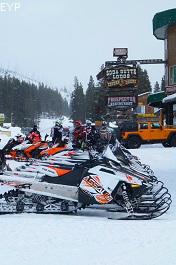 Snowmobilers leaving Cooke City Montana and heading up to the Beartooth Highway. 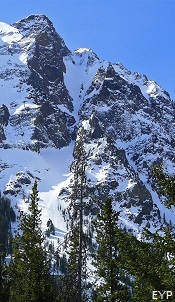 Huge mountains covered in deep blankets of snow surround Cooke City and Silver Gate Montana near Yellowstone National Park. 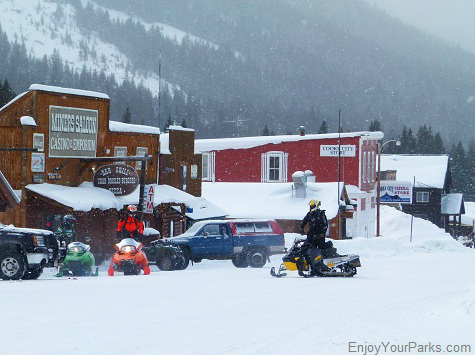 Downtown Cooke City Montana in the middle of winter. 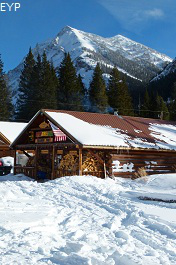 The historic Range Rider Lodge in Silver Gate Montana was at one time one of the largest log structures in the United States. 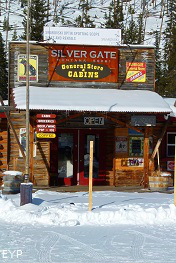 Silver Gate General Store in Silver Gate Montana near Yellowstone Park. 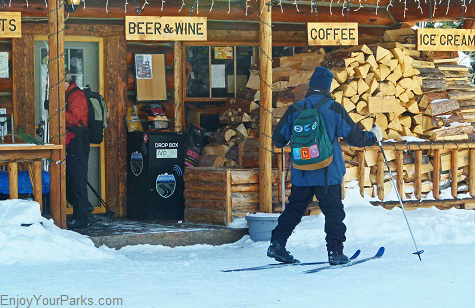 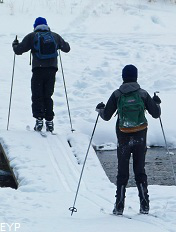 Cross Country Skiing is a very popular winter sport around Silver Gate Montana and Cooke City Montana near Yellowstone National Park. 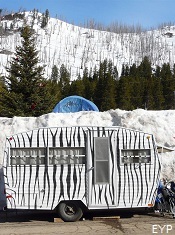 Beartooth Plateau Outfitters in Cooke City Montana, near Yellowstone National Park. 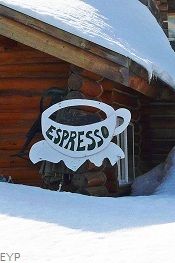 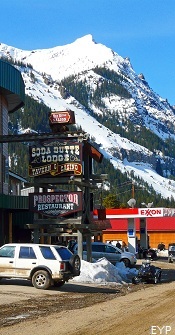 Another classic scene of Downtown Cooke City in winter. 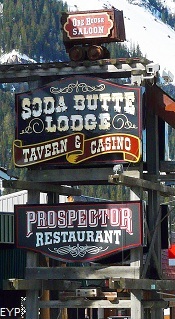 Soda Butte Lodge in Cooke City Montana near Yellowstone National Park. 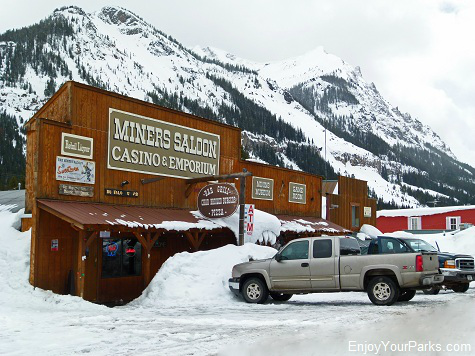 Cooke City Montana and Silver Gate Montana are wonderful mountain towns that we ALWAYS thoroughly enjoy spending time at.